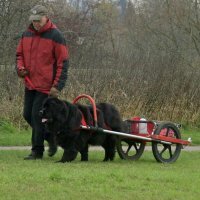 It is generally acknowledged that the Newfoundland, as a unique breed, was bred by its originators in Canada to be a big powerful dog capable of an arduous days work either on board a fishing boat or on shore. On land it was extensively used as beast of burden as well as being the friend and guardian of the family, especially the children. Without wanting to endanger their dog or anyone else, the modern day owner increasingly wants to see whether their dog is equally capable. This set of exercises, which will test the dog at five levels, has been devised to provide a safe and consistent method of proving the dog's capabilities in a non-competitive environment. These tests, which are extensions to training and not an end in themselves, are based on the building block principle. Skills learnt by owner and dog for the lower levels are repeated and refined or modified in higher level tests. It must be understood that it is necessary to MASTER the lower levels first in order to proceed to the higher levels. If a problem arises with a certain manoeuvre then there will be a firm foundation to fall back on; if training is carried out inconsistently then a problem cannot be dealt with systematically. Thus dogs must pass each lower level before being permitted to attempt the next highest level, i.e. passing the Beginners Test before Level 1, and Level 1 before entering for Level 2 etc. It must be borne in mind that the exercises actually test the owner and dog partnership, not just the capabilities of the dog. On a test day there will be two judges and it is their desire for all the dogs to pass. Entrants may ask the judges questions during the test if they are unsure whether they are permitted to do something or not. 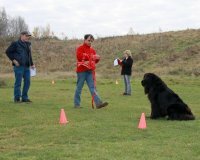 Judges may volunteer some advice to help entrants and their dogs during the test. To guide entrants, a breakdown of the available points is shown within the exercises. The judges will be using a scoring system for marking each performance. These marks are purely for their use and will not be divulged to entrants. The published results will only show whether the required standard was reached. The dog and owner must reach the required standard in each exercise otherwise they will fail the test as a whole. At the conclusion of each test the judges will inform entrants whether they and their dog have passed or failed and probably make some verbal comments. There will also be written comments to collect from the score steward, together with a certificate of competence for a pass. These tests are non-competitive. However, if a competitive trial, with dogs/owners being placed in order of competence is being arranged, then these regulations may be the basis for those trials. 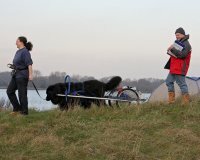 A test day is for entrants to enjoy working with their dogs and delight in their joint achievements and those of fellow Newfoundland owners. Even at a test, remember never to become so serious that the fun goes out of working for either you or your Newfoundland. Dogs must be at least 15 months old on the day of the test to enter for the Beginners Level, 18 months for Level 1, 24 months for Level 2 & 3 and 30 months for Level 4. Dogs aged 8 years and over cannot enter for Level 4. These ages have been set in the best interests of the dog, bearing in mind its physical and mental capabilities. Owners are encouraged to start training their dog only when it is capable of performing all elements without undue strain. By making an entry, an owner declares that their dog is fit to carry out the proposed test. If it appears to any official at a test event that a dog is not fit enough they must not allow it to take part (See Explanatory Note 11 in the full regulations). A dog can only be entered for one level which it has not passed, per event, but may retake any level for which it already holds a pass, i.e. one new (un-passed) level, at a weekend event. Owners are responsible for the control of their dogs at all times. Exercising of dogs within the designated test area is prohibited. All dogs must be kept on a lead while the tests are being conducted unless stated in the Regulations, when a steward will be in fairly close proximity in the event of a problem arising. Beginners Tests can be conducted, informally, by two Judges from the approved list, provided one of them has previously satisfactorily judged at this level. This test does not have to be carried out at an organised event and can be arranged by the owners at their and the Judge's convenience. The Chairman of the Working Sub- Committee will sanction the chosen judges on receipt of a phone call or letter from the organisers. It is the responsibility of the organisers to notify any passes with any other relevant information to Working Sub-committee of the club hosting the test, so that the matter can be formally reported at the next committee meeting. A team (more than one dog) can be entered at all levels except the level 4 travois test. 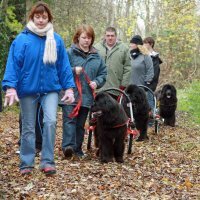 Each individual dog must have passed the Level being attempted before it can be entered as a part of a team. The Control Section of a team test will be carried out collectively. 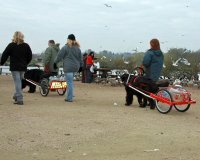 In the Pull Section for a team the regulations shall be modified so that all references to the dog shall be read as the team of dogs; the weight to be carried as a load shall be increased by 50% for the second and any subsequent members of a team.